Your wall-to-wall carpeting is evolving a foul odour? Asking yourself how to clean coffee stains off your carpet? Better Cleaning Company is an professional carpet cleaning Swiss Cottage NW8 company which can help you at an affordable price. Our carpet cleaners are all trained and experienced to a top quality commercial and domestic carpet spot cleaning service in the area. Call 020 3746 3201 or send us an inquiry online now. We will provide you with a free and non-binding price offer at any time. Affordable carpet repair offered by the best cleaners ! Our experienced cleaning technicians will examine your carpet, test all detergents on a small and hidden spot and will hoover the carpet before continuing with the stain pre-treatment and the deep carpet cleaning. Deep carpet cleaning can be either dry carpet cleaning or steam carpet cleaning Swiss Cottage. Both are highly effective carpet cleaning methods. If your carpet can be safely washed, our steam carpet cleaners will shampoo and wash it with the help of hot water extraction machine. For delicate synthetic or natural fibres, our dry carpet cleaners will perform a dry substance cleaning which doesn’t involve the use of water. Better Cleaning Company was established in 2006 as a professional cleaning services company, and since then we have grown to be among the best carpet care companies. 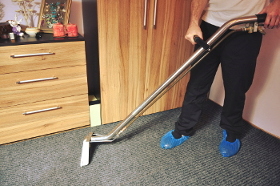 Each one of our carpet cleaners Swiss Cottage NW8 are background checked, hired based on recommendations, experienced and trained meticulously to get all carpet types cleaned safely and efficiently. We work with the latest professional cleaning tools and perfectly safe professional cleaning products to clean your carpets and remove various spots. Our carpet treatment service can also include applying fibre protection spray and deodorising. So, if you want your carpet cleaned from all the dust, stains and dirt - order our top-class carpet repair service now! Take advantage of our user friendly 24/7 simple reservations system right away. Call us 020 3746 3201 or send us a request online here, and we will send you over our excellent carpet cleaning experts in Swiss Cottage NW8 on any day you of the year. For your convenience we offer weekend and bank holiday availability. We have fixed and quite affordable prices. We require no deposit for the booking and we will give you a discount of up to 15% of any service you book together with the carpet treatment. Estate agencies, regular customers, landlords and clients who book our services early on will all get special rates. Make a free and quick reservation today!